Bedside transthoracic echocardiography (TTE) is useful for rapid assessment and treatment of hemodynamic disturbances. Transthoracic echocardiography is not standard in Canadian anesthesia training even though undifferentiated hemodynamic disturbances are common in the perioperative setting. The objectives of this pilot study were to determine 1) whether it is feasible to implement a focused bedside TTE curriculum within core anesthesiology training, 2) whether changes could be detected and quantified following the program of study, and 3) whether curriculum implementation might lead to a significant increase in anesthesiology residents’ TTE knowledge-base. 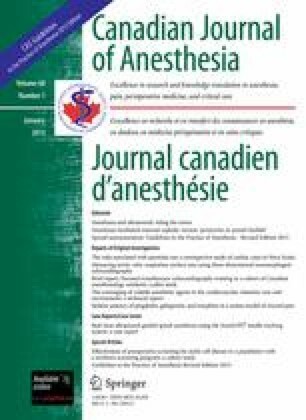 In this single-centre cohort pilot investigation, anesthesiology residents at Queen’s University received focused bedside TTE training during the winter of 2011. The curriculum consisted of four three-hour sessions with both didactic and practical components. Pre- and post-curriculum examinations were administered, and examination results were compared using non-parametric tests. The primary outcome was the difference in mean pre- and post-curriculum examination scores. Ten participants completed pre- and post-curriculum examinations. Four residents were unable to participate in the curriculum but served as controls. Mean pretest scores (out of 50) were similar between the two groups (participants 23.9 vs controls 23.5; P = 0.83, Mann-Whitney U). Mean scores improved by 13.0 points following intervention but improved by only 1.3 points for controls, (P = 0.009, Mann-Whitney U). This pilot investigation suggests that implementation of a focused bedside TTE curriculum within anesthesia training is feasible, quantifiable, and effective for increasing anesthesia residents’ TTE knowledge-base. This pilot study suggests that further investigation is warranted to determine the impact of this perioperative TTE curriculum. Rob C. Tanzola, Rene V. Allard, and Ramiro Arellano made substantial contributions to the conception and design of the study and to the acquisition of data. Rob C. Tanzola, Rene V. Allard, Ramiro Arellano, Sam Walsh, Wilma M. Hopman, and Devin Sydor made substantial contributions to the analysis and interpretation of data as well as to the preparation of the manuscript. L’échocardiographie transthoracique (ÉTT) au chevet est utile pour évaluer et traiter rapidement les troubles hémodynamiques. L’échocardiographie transthoracique ne fait pas partie de la formation standard en anesthésie au Canada, bien que les troubles hémodynamiques non différenciés soient courants dans le contexte périopératoire. Les objectifs de cette étude pilote étaient de déterminer: 1) s’il est faisable de mettre en œuvre un programme de cours ciblé d’ÉTT au chevet dans la formation de base en anesthésiologie; 2) si des changements pourraient être observés et quantifiés à la suite du programme d’étude; et 3) si la mise en œuvre d’un tel programme engendrerait une augmentation significative de la base de connaissances en ÉTT des résidents en anesthésiologie. Dans cette étude pilote de cohorte dans un seul centre, les résidents en anesthésiologie de l’université Queen’s ont suivi une formation ciblée en ÉTT au chevet pendant l’hiver 2011. Le programme de cours comprenait quatre séances de trois heures avec des composantes didactiques et pratiques. Des examens avant et après le programme ont été réalisés, et les résultats des examens ont été comparés à l’aide de tests non paramétriques. Le critère d’évaluation principal était la différence dans les notes moyennes d’examen avant et après le programme de cours. Dix participants ont passé les examens avant et après le programme ciblé. Quatre résidents n’ont pas pu participer au programme de cours mais ont servi de témoins. Les notes moyennes pré-test (sur 50) étaient semblables entre les deux groupes (participants 23,9 vs témoins 23,5; P = 0,83, Mann-Whitney U). Les notes moyennes se sont améliorées de 13,0 points après l’intervention mais ne se sont améliorées que de 1,3 point dans le groupe témoin (P = 0,009, Mann-Whitney U). Cette étude pilote suggère que la mise en œuvre d’un programme de formation ciblée en ÉTT au chevet dans le cadre de la formation en anesthésie est faisable, quantifiable et efficace pour améliorer la base de connaissances en ÉTT des résidents en anesthésie. Cette étude pilote suggère que des recherches supplémentaires sont nécessaires pour déterminer l’impact de ce programme d’ÉTT périopératoire. The Royal College’s anesthesiology specialty training requirements do not include training in focused TTE. Given the rapidly expanding use of ultrasound in anesthesiology practice and obvious clinical utility in the perioperative setting, it is foreseeable that focused TTE training will eventually become a part of anesthesiology resident education. Accordingly, a focused TTE curriculum was developed for anesthesiology residents at our centre with the goal to achieve Level 1 competence, defined as basic training that involves familiarity with indications, image acquisition, and recognition of basic pathology.8,9 The purposes of this pilot study were to determine 1) whether it was feasible to implement a focused TTE course into the anesthesia residents’ core lecture series, 2) whether changes could be detected and quantified following the curriculum, and 3) whether the curriculum appeared to improve anesthesia residents’ understanding of focused TTE and their ability to interpret images. Following approval from the Queen’s University Faculty of Health Sciences & Affiliated Teaching Hospitals Research Ethics Board (protocol#ANAE-181-10, approved November, 2010) and signed informed consent from each participant, a prospective observational study was undertaken involving years 1-4 residents in the anesthesiology program at Queen’s University during the winter of 2011. The intervention was a curriculum developed to teach concise focused TTE. All anesthesiology residents in postgraduate years 1-4 of their training were eligible for recruitment. Those who completed the teaching curriculum were assigned to the intervention group. The data collected included baseline demographics, information regarding previous exposure to TTE, and self-rated knowledge prior to training. To assess educational benefit of the curriculum, participants completed a written 50-question multiple-choice examination before the first session and again after the last session (four weeks following the first exam). The primary outcome was the change in performance on the multiple-choice exam. A group of staff cardiac anesthesiologists with National Board of Echocardiography certification in perioperative transesophageal echocardiography (TEE) and clinical experience with focused TTE served as experts. The examination was administered to the experts to show its ability to discriminate between novice and expert anesthesiologists. Residents who were unavailable for the teaching sessions were assigned to the novice group. These participants did not receive training but completed the before and after examinations and served as controls to show that improvements resulted from the curriculum and not from repeating the examination. The TTE curriculum was developed by two study authors (R.T. and R.V.A.). It consisted of four three-hour weekly learning sessions that included a two-hour didactic session followed by a one-hour practical “hands-on” session. The didactic sessions were organized as follows: 1) Ultrasound basics and standard views, 2) Left ventricle (LV) and Right ventricle (RV) assessment, 3) Volume assessment and hemodynamics, and 4) Pericardial disease. Pathologic states covered in the sessions included LV and RV dysfunction, pulmonary embolism, cardiac tamponade, and hypovolemia. Comprehensive valvular assessment was not a goal of the teaching curriculum. The goal of the practical sessions was to gain experience in image acquisition and interpretation of normal echocardiographic findings. Participants obtained the following images in normal subjects: the parasternal long-axis view, parasternal short-axis view, apical four-chamber view, subcostal four-chamber view, and subcostal inferior vena cava view. Guided formative feedback was provided by staff experts. An examination consisting of 50 multiple-choice questions was developed to test the content of the learning sessions. It assessed ultrasound fundamentals, anatomy and imaging windows, as well as interpretation of static images and video clips of both normal and abnormal findings. Twenty-five percent (13 questions) of the questions were video clips. Data were entered into an Excel spreadsheet and imported into IBM SPSS (IBM Corporation, Armonk, NY, USA; version 20.0 for Windows) for analysis. Data were first analyzed descriptively, overall and by group. Means, standard deviations (SD), and 95% confidence intervals (CI) were used for continuous data, such as the scores, and frequencies and percentages were used for categorical data, such as post-graduate year and previous experience. Groups were then compared using Chi square tests (Fisher’s exact) for categorical data and using the non-parametric Mann-Whitney U and Wilcoxon signed-ranks test (due to the small sample sizes) for the continuous data. Significance was set at P < 0.05. A priori sample size calculations were not undertaken for this pilot investigation. Ten of the 20 residents eligible for the study completed both the curriculum and the pre- and post-examinations. Four residents were unavailable for the training sessions, but they were geographically present at the centre and served as novice controls. The remaining six residents either did not complete the training or were not present at the time of the study and therefore were not included in the study (Figure). Four staff anesthesiologists served as experts. Table 1 includes each participant’s individual pretest and post-test scores, percent change, level of training, and the self-rated knowledge score for both the intervention and novice groups. Five (50%) of the residents who completed the curriculum and exams had some coincidental exposure to TEE in the clinical setting but no formal training. Most residents reported no prior experience with TTE with the exception of two subjects who had served as models in an unrelated focused TTE course. Table 2 shows the mean test scores for the intervention and novice groups as well as the SDs, 95% CIs, and the tests of significance. On paired-samples testing (Wilcoxon), the intervention group’s scores showed significant improvement (P = 0.005) while the novice group’s scores resulted in little change. The improvement was consistent in both the written and video components of the examination (data not shown). The mean pretest scores were similar for both groups (intervention group 23.9 vs novice group 23.5; P = 0.83, Mann-Whitney U). The intervention group’s post-test scores improved to 36.9 but there was little change to the novice group’s scores at 24.7 (P = 0.028). The change in scores from pretest to post-test also differed significantly between groups (intervention 13.0 vs novice 1.3; P = 0.009). There was no significant association between change in scores and year of training or prior clinical experience. The mean test score obtained from the four experts was 44.8 (SD 2.5), which was significantly higher than either the intervention group (23.9) or the novice group (23.5) at baseline (P = 0.012, Kruskal-Wallis test). This pilot investigation suggests that implementing a TTE training curriculum into anesthesiology core training is not only feasible within the busy anesthesiology curriculum, but it also suggests that it may be feasible to detect and measure quantitative changes in performance as a result of the curriculum. In addition, this pilot study suggests that anesthesia residents’ knowledge base in TTE can be significantly increased with the curriculum. The fact that no significant differences were observed between the novices’ pre- and post-test scores suggests that the change observed in the intervention group was not a result of simply re-testing. Furthermore, the fact that a significant difference was observed between the scores of the intervention group and the experts suggests that the examination discriminates effectively between levels of knowledge. Anesthesiologists frequently diagnose and treat patients with life-threatening cardiovascular instability caused by a variety of undifferentiated conditions. Traditionally, these patients are assessed using clinical skills along with invasive pressure-based modalities, such as central venous or pulmonary artery catheters. Regrettably, these modalities have limited value for providing diagnoses in undifferentiated patients.14 On the other hand, focused echocardiography has been shown to provide important diagnostic information not readily available by other means. It can assist in the accurate and prompt evaluation of cardiac function and volume status, important diagnostic information necessary for correct and timely management. Echocardiography performed by anesthesiologists is limited largely to transesophageal echocardiography (TEE). The value of TEE use during cardiac surgery procedures is well-documented and standard in this setting.15 Conversely the use of TEE in non-cardiac surgery is not routine, and it is rare for anesthesiologists to perform perioperative TTE. When it has been used, TTE has been shown to have significant impact on the perioperative management of patients.2,16,17 In these studies, however, the anesthesiologists were usually TEE-trained, often having completed cardiac anesthesiology fellowships in which comprehensive echocardiography training is routine. The role of focused perioperative TTE by non-TEE-trained anesthesiologists is therefore not well-defined. Given the limited training, its role would be most appropriately restricted to that of a diagnostic tool for the management of unanticipated undifferentiated hemodynamic instability rather than as a routine screening or monitoring modality that would best be left to echocardiographers with advanced training. Whereas other specialties have long been advocates of focused TTE, anesthesiology has lagged behind in the adoption of this modality. There is no requirement to include TTE training within anesthesiology residency programs despite the fact that this modality can aid in the diagnoses that present regularly in clinical practice. The reasons for this are multifactorial and became only more evident during our pilot study: the limited time within residency to devote to formal teaching of TTE, the limited availability of residents to attend organized teaching sessions (particularly in training programs spread across multiple teaching hospitals), the lack of teaching expertise and equipment available within departments, and the lack of existing standardized curriculum. These are some important barriers to the implementation of a focused TTE curriculum that need to be addressed both in future large-scale studies and in future wide-scale efforts to incorporate focused TTE into standard anesthesiology training curriculum. There are several limitations to this pilot study. First, the small sample size limits the generalizability of results from this study to other populations and also requires the results of statistical tests to be interpreted within this context. Second, although results showed improved exam scores, we did not assess whether the results were associated with an improved ability to perform focused TTE either on healthy volunteers or in the clinical setting. Obtaining adequate imaging is often the most difficult part of a focused TTE examination even when it is performed on properly positioned and carefully selected healthy volunteers. Image acquisition can be particularly difficult in the perioperative period with variations in body habitus combined with an inability to position patients properly. Third, due to the voluntary nature of the study and inevitable scheduling conflicts, not all eligible residents completed the training curriculum, and they were therefore excluded from data analysis. This exclusion may have led to a selection bias, as we used a convenience sample. Fourth, some residents included in the study had some prior exposure to echocardiography in an informal setting, such as during a cardiac anesthesiology or an intensive care unit rotation, and this prior exposure may have decreased the impact of the training curriculum. Fifth, it is known that many educational initiatives provide short-term improvements to knowledge and performance, but longer-term retention can be poor, especially if not reinforced.18 This study did not address the issue of knowledge retention. Finally, the multiple-choice examination we used was not formally validated to assess for a standard level of proficiency in echocardiography. Having participants complete a validated basic level certification examination would help confirm that this training curriculum improves their knowledge base and ability to interpret TTE images in the clinical setting. In conclusion, this pilot study suggests the feasibility of introducing a focused TTE curriculum within anesthesiology training and of measuring the quantitative change in anesthesiology residents’ knowledge of TTE as a result of the program. In our small study, the residents’ interpretation of focused TTE images is significantly improved by a limited curriculum consisting of a combination of didactic and practical sessions. This pilot investigation also served to identify important barriers to implementation that need to be addressed in future studies and wide-scale implementation efforts. The ultimate goal of a focused TTE curriculum within anesthesiology training would be to enable future anesthesiologists to use this diagnostic tool independently in clinical practice to improve patient outcomes. Additional fully powered investigations are needed to assess residents’ ability (after a limited curriculum) to perform accurately and to interpret and retain information in order to use focused TTE in the clinical setting. Queen’s University Research Initiation Grant to Rob Tanzola. Royal College of Physicians and Surgeons of Canada. Objectives of Training in Emergency Medicine – 2008, reviewed in 2011. Available from URL: http://rcpsc.medical.org/residency/certification/objectives/emergmed_e.pdf (accessed June 2012).